I am having tea outside because it's such a pretty day to enjoy the outdoors. I've made some Strawberry and Cream Puff Pastry Shells. Would you like to join me for one and a cup of Mrs. Patmore's Pudding Tea? I've cut some knock-out roses from my bushes in the background, to fill my lady vase. Yes, I'm using the gingham cloth that I made again. These are so easy to make...just zig-zag about 1/2-3/4" from the edges of your square, and then pull the threads to fray the edges. The strawberry teapot that my sister gave me is perfect for today's tea. Isn't this snack set so pretty? My sweet friend, Linda, gave me this for my birthday, and underneath it says Fraisier des jardins, Mann 1975. It's perfect for breakfast, lunch or snack. Thank you, Linda! Bake the puff pastry shells according to directions on the box. Separate the top and remove the filament inside the shells. Let cool. Mix the instant vanilla pudding with the milk for about two minutes. Fold in the thawed frozen whipped topping. Add the chopped strawberries, however many you would like, and fill the the shells. Top with a whole strawberry. I like to add the top of the puff pastry shells, also. Kitty, I'd love to sit, visit. have tea and a bite of your scrumptious looking pastry shells filled with those scrumptious strawberries! What a sweet post! I sure do love your blog, it's beautiful, love the black and white, so classy with the reds! What a pretty backdrop to your tea table. So happy you could spend time outdoors. Your lovely napkin goes so well with your Strawberry Tea Set. Love the tea pot set upon the scale too. Have a wonderful week. I just love your garden setting! Strawberries make me think of the warm weather of summer. We bought some organic ones at our Farmers' Market on Saturday and they were so sweet and delicious. This is a fun summer dessert for hot nights. Thanks for sharing! Your teapot is just adorable! So clever to place it on the scale. Enjoy your cream puffs! What a beautiful background for an afternoon tea; roses, waterfall and lush green plants. 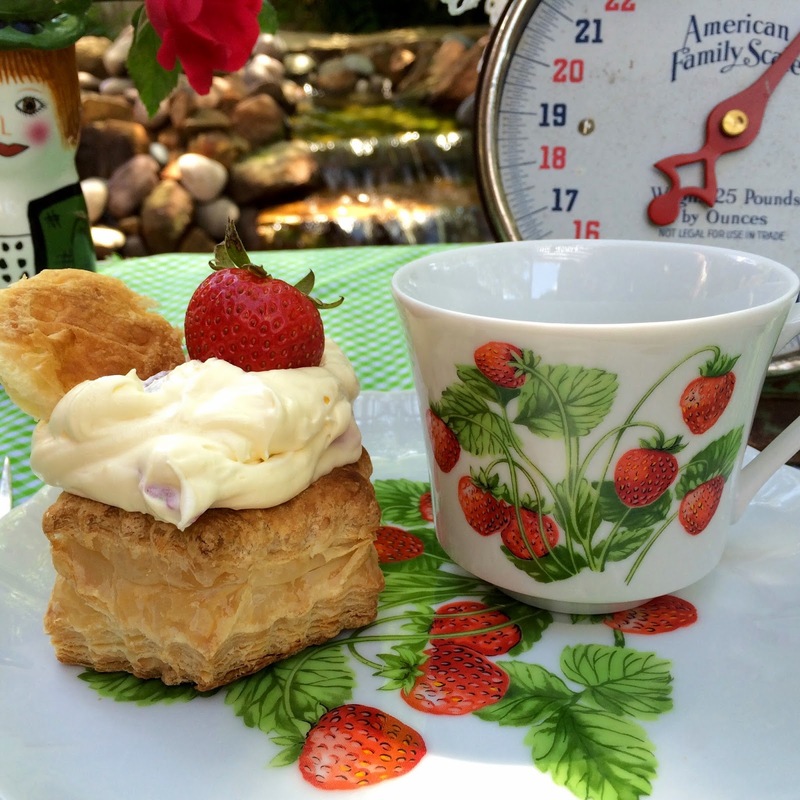 Perfect plate for serving the delicious looking strawberry cream puffs. Looks like a summer table! A June table for us poor folks way up here. Whatever the month, it sure is pretty! Those look wonderful! I have used them to make chicken dishes, but hadn't thought about dessert...silly me! Love your strawberry snack set! Thanks so much for linking to Tuesday Cuppa Tea! I love gingham .. guess that ages me!!!! That's ok. Your snack set is adorable ... love those strawberries. How was Mrs. Pattmore's Tea? You are so lucky to have tea outside. My mouth always waters when I visit with you! Happy Tea Day! I love your snack set. It is just perfect for a tea or a brunch with the girls. Love your strawberry and cream pastry. What a wonderful pool/pond. This spot is perfect and what a lovely day. I love your teapot with the strawberry motif. Your baking skills never fail! Delicious! Lovely spread by a sweet lady! Oh, yummy! Sigh . . . would love some strawberries and puff pastry! How wonderful to have such a pretty tea outside. 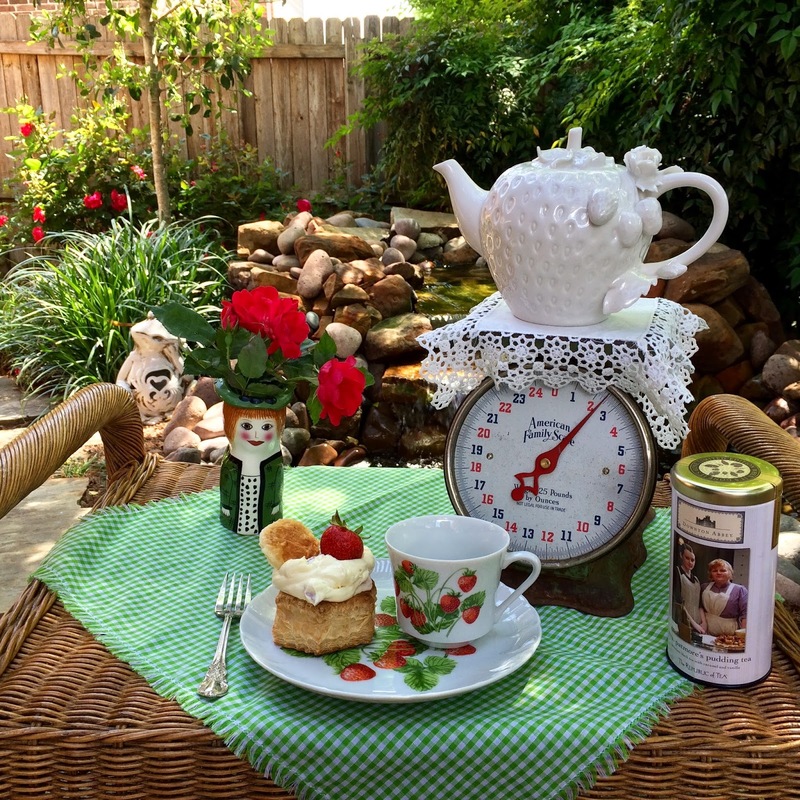 Your backyard looks so inviting, as does your pretty tea table, with the gingham cloth and pretty tea set. I'd love to join you for a cup of Mrs. Patmore's Pudding Tea. The selection of DA teas in my neck of the woods is limited so I've only had the English Rose Tea. Kitty, your strawberry dishes are so perfect with your pastry. I can't wait to try it! Love the peek into your beautiful backyard. Have a wonderful week! I love your backyard!! With all the rain we've had it certainly has brightened all the lawns,flowers and plants. Your tea set is so pretty! You know, I was just thinking this evening about a strawberry dessert. :) Think I need to try this. What a pretty snack set! I only wish I could eat strawberries! I always keep a box of puff pastry in my freezer. You never know when you will need it! Your backyard is lovely. You received a pretty strawberry snack set for a gift and your dessert this week looks easy to make and delicious. I'll bet we see strawberry shortcake on the plate before long! Just delightful, Kitty...the sunshine, the garden setting, the pretty teapot & strawberry cup with luncheon plate...LOVE it all. Thanks for such an easy~peasy recipe, too. You always make the most yummy tasting items. I have to say I love the sound of the strawberry desert almost more than I love your cup and plate. And I think that even I could make that table cloth, so easy. What a sweet way to welcome spring, Kitty. Love your alfresco table setting. Hi Kitty, you always make it sooo easy to just whip up something. I love it. The strawberry china is wonderful. 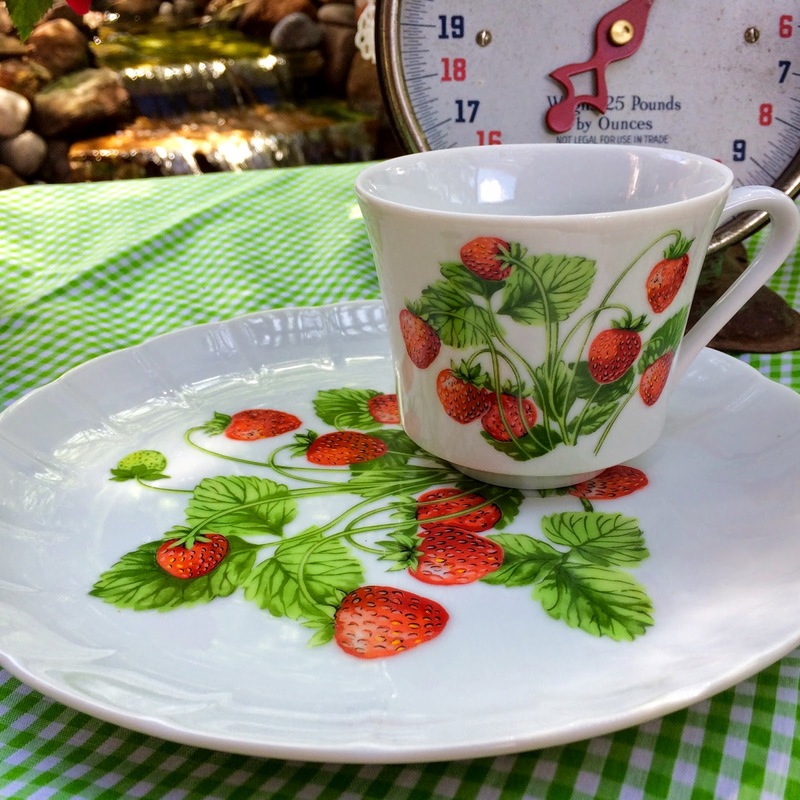 I always wish I had a strawberry teacup during strawberry season, so I just might have to start looking now! 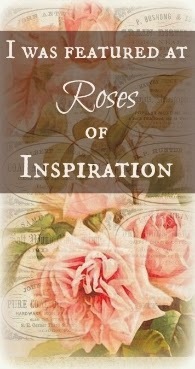 Thank you so much for sharing your sweetness with Roses of Inspiration. Love to you! Love your creamy, yummy strawberry snack! When my daughters were small, I showed a group of Girl Scouts how to make dinner napkins like your gingham cloth. I had pre-stitched around the edges for them, then helped them fray the edges. We did it as a Mother's Day gift. I used three different colors of gingham - yellow, orange, and green. Sweet memory, thanks for bringing it back! Aww Kitty, your tea looks absolutely define. I love puff pastry, one of my favorite types of dessert. I will have to make these for my dear husband, he'd love them. What a beautiful tea set, so spring looking and fresh. It's always a delight to visit with you, Kitty. Have a beautiful and blessed week-end. Yes! I would love to join you for a spot of pudding tea and a strawberry puff pastry Kitty! You really know how to enjoy your afternoon tea! I love puff pastry, and I know I would love it full of pudding, strawberries and whipped cream~pinned to my dessert board! Yum, Kitty, this looks so pretty and sounds delicious!! I've never met a strawberry dessert I didn't like. :-D I do love the Pepperidge Farm Puff Pastry Shells; they're so convenient and versatile. Thanks for sharing this recipe with us. I love, love your strawberry mug and plate and the teapot your sister gave you. It's all just charming for tea and strawberries outdoors. I hope you have a wonderful weekend!! I just love your strawberry plate and cup set, dear Kitty! And the tea pot is so gorgeous! Tea outside is always enjoyable...at least once a week I make a point of making a pretty tea tray for my sweet mother and I and we sit in the garden soaking up some sun and admiring our Lord's beautiful creation! Hmmm, and your strawberry and cream puff pies sound simply divine - what delicious things you create! Lots of love and hugs and hope your Sunday is a wonderful one! Hello, my friend! I just wanted to let you know that this beautiful post will be featured tomorrow at Roses of Inspiration. Thanks for joining the party. Happy hugs! The cup and dessert plate are gorgeous! They're just what I'd love to see on a table this time of year when our strawberry season is right around the corner. The dessert looks fabulous, and your images make it all way too irresistible! Ooh...strawberries! So pretty to look at but even better to eat! Your dessert sounds so yummy and easy too!. I do love me some gingham and you have set up lovely tea time table...love the strawberry cup and plate. The local strawberries are now in the markets here in NC where I live...can't wait to get me some! Yum Kitty, it looks delicious and I love your pretty strawberry snack set! Thanks for sharing with SYC.